Damascus, SANA – A governmental delegation consisting of the Ministers of Public Works and Housing, Health, and Local Administration and Environment along with the Governors of Damascus and Damascus Countryside visited on Monday Daraya city as a part of the government’s efforts to launch the process of rehabilitating infrastructure and public facilities in the city. 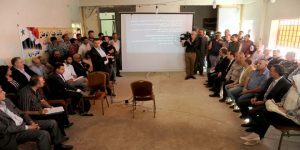 The delegation held a meeting at Daraya Cultural Center with the concerned officials from Damascus and Damascus Countryside Governorates, in which they studied the new regulation project that will connect Damascus Countryside with the city administratively. 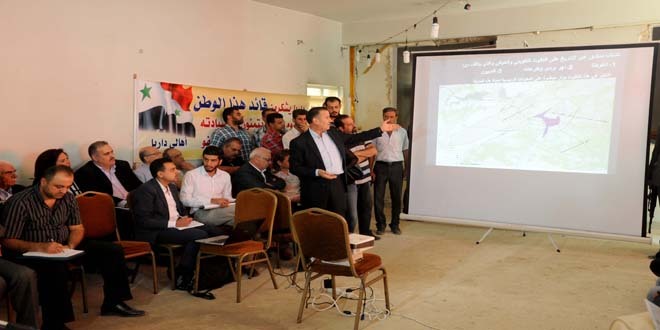 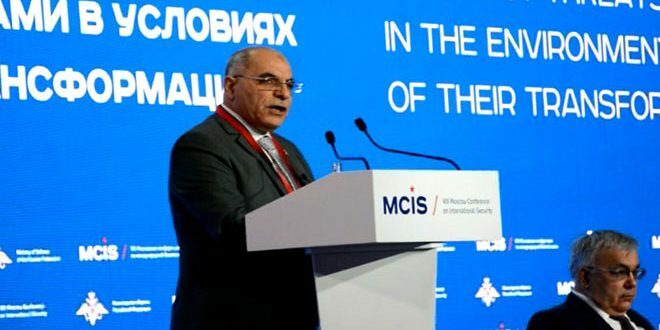 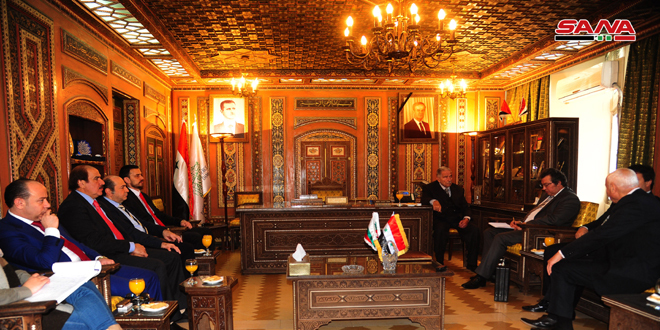 Local Administration and Environment Minister Hussein Makhlouf pointed out that the meeting aims at discussing the mechanisms of Daraya’s rehabilitation and evaluating the damage caused to infrastructure, health and educational facilities, public services, roads, and electricity and water networks. 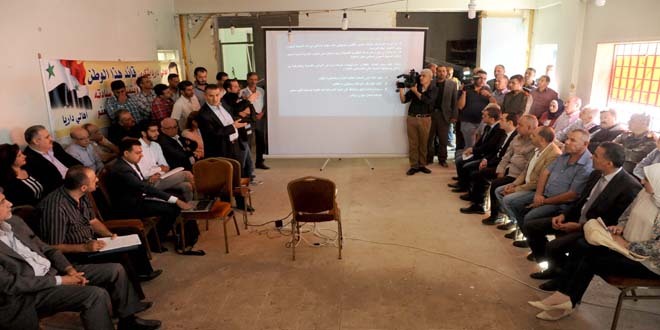 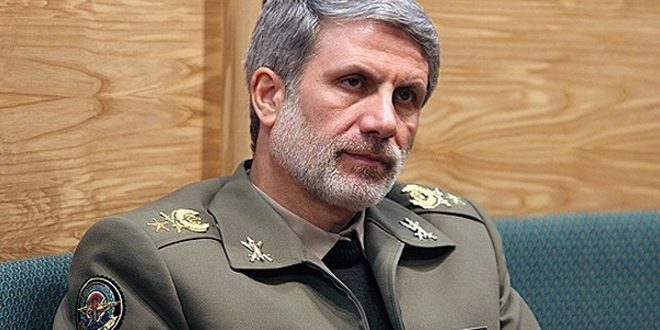 In turn, Health Minister Nizar Yazigi said the necessary studies for the medical needs of the city will be prepared and the required budget for providing these needs will be allocated after assessing the damage to health facilities in Daraya as a result of the acts of terrorist organizations. 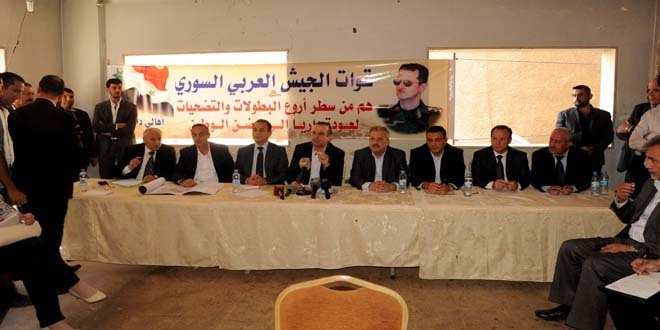 For his part, Governor of Damascus Countryside Alaa Munir Ibrahim said that vehicles entered the city and started work today, and public sector companies will enter for the rehabilitation of areas within the organizational chart in phases according to the reconstruction plans adopted by the government through the reconstruction committee.